Enjoy 2 hours of restorative bliss, assisted by amazing bodyworkers. Take the edge off and bring relaxation to a whole new level with Radically Restorative Yoga! Alex Bauermeister guides a meditative sequence of floor-based, gentle poses while a team of assistants provide hands-on healing through massage, cranial sacral, Thai massage, and energy-based therapies. This 2-hour self-care experience will soothe your muscles, appease your joints, unburden your mind, and relieve deep-set tension. Your body will thank you! $35 in advance/ $40 at the door. This class is limited in number so be sure to reserve your spot. Slow flow your way into restorative bliss with juicy hands-on assists. Alex teams up with a different co-teacher each month for an hour of luscious slow flow, followed by an hour of relaxation poses, with an abundance of assists throughout, offered by both teachers and two assistants. ABOUT YOUR MAY CO-TEACHERS : Laura Ahrens guides the first hour of embodied slow flow, then Alex Bauermeister brings the restorative magic. Two studio assistants trained in yogic assists will complete your self-care team. CLASS DETAILS : Meditative movement will unravel tension, rejuvenate your body and energy, and prepare your whole being to receive the restorative benefits of stillness and relaxation. Meanwhile, deeply attuned hands-on assists will help you feel divinely supported in your poses. You will leave this two-hour class feeling physically and emotionally grounded, unburdened, and re-centered. All bodies and all abilities truly welcome. COST : Sign up a week early and pay $35, otherwise $40. Save the date for upcoming collaborations: June 1, July 27, all 6-8pm. Curious about yoga therapy? Join this small group mini workshop and get oriented. You'll witness a demonstration of yoga therapy, engage in Q&A discussion, and get a sense if yoga therapy is right for you. Ideal for individuals or couples interested in yoga therapy services, as well as those interested in yoga therapy professional training. Held at Alex's yoga therapy office in Roslindale Village. Cost is $25 per person. Space is limited to please sign up online for any of the dates. You're welcome to come to multiple workshops if you'd like to witness several demos of the work. Enjoy 2 hours of restorative bliss, assisted by amazing bodyworkers at the beautiful JP Centre Yoga Studio. Alex Bauermeister guides a meditative sequence of floor-based, gentle poses while a team of assistants provide hands-on healing through massage, cranial sacral, Thai massage, and energy-based therapies. This 2-hour self-care experience will soothe your muscles, appease your joints, unburden your mind, and relieve deep-set tension. Your body will thank you! ABOUT YOUR CO-TEACHERS : Tatyana Souza guides the first hour of embodied slow flow, then Alex Bauermeister brings the restorative magic. Two studio assistants trained in yogic assists will complete your self-care team. No previous bodywork experience required, but participants must have some previous exposure to restorative yoga postures. Workshop participants will have the opportunity in the future to assist Alex's Radically Restorative Yoga workshops at JPCY. ABOUT YOUR CO-TEACHERS : To be announced! :) Two studio assistants trained in yogic assists will complete your self-care team. This training is for anyone looking to provide restorative yoga experiences to individual clients or groups of students. A previous YTT 200 is helpful but not required, as the elements of this training can be applied to all kinds of healing professions. If you're interested in taking this training to deepen your personal practice, or if you have general questions, please inquire with Alex or Brenna. In support of diversifying the face of yoga leadership, people of color registering for this training can use discount code diverseleadership25 and save 25% off of the full price. 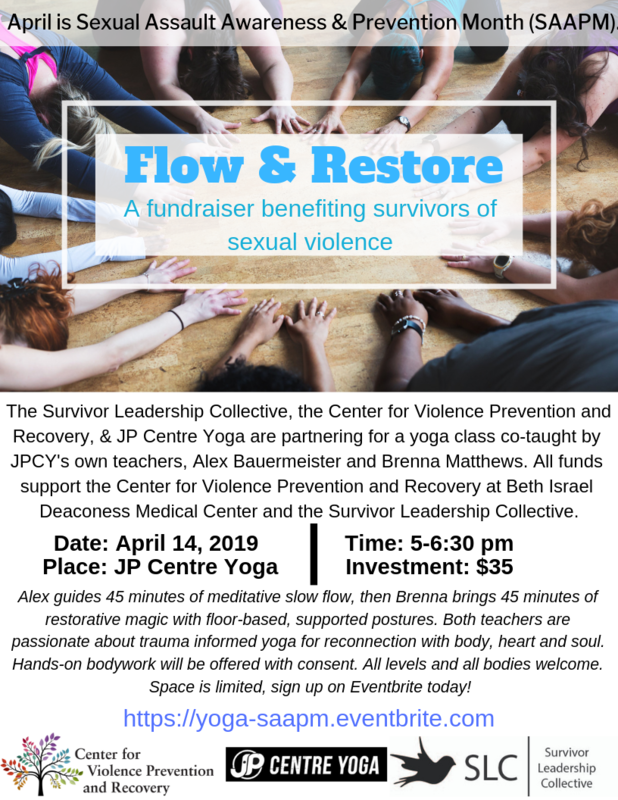 Alex teams up with Brenna Matthews to teach a special Flow & Restore fundraiser class, benefiting survivors of sexual and domestic violence. 100% of the proceeds will go toward benefiting the work of Survivor Leadership Collective and the Center for Violence Prevention and Recovery at Beth Israel Deaconess Medical Center. Alex guides 45 minutes of meditative slow flow, then Brenna brings 45 minutes of restorative magic with floor-based, supported postures. Both teachers are passionate about trauma informed yoga for reconnection with body, heart and soul. Hands-on bodywork will be offered with consent. All levels and all bodies welcome! Luscious flow & assists for two. Grab a partner -- any partner! -- for this special hands-on yoga class. Alex Bauermeister will guide 2 hours of flowing partner poses and blissful assists to deepen your connection to yourself, each other, and your yoga practice. Please register yourself as well as your +1. This is an all levels experience -- some previous yoga experience is helpful but not necessary. Cost is $25 per person. Alex Bauermeister will lead soul-searching yogis like you into the new year. This all-levels mind-body practice will blend gentle movement and stillness to create deeper awareness. Part meditative flow and part inner meditative practice, Alex will guide you through all layers of yourself to create alignment from the inside out. You'll reflect on the past, discern what's actually true for you NOW, and uncover meaningful intention for the New Year. It's like dusting off your inner compass to help you make awesomely aligned choices in 2019. Bring a journal and an openness to connection ... both with yourself and with one another. New Year's Awakening is appropriate for beginners and seasoned yogis alike who share an interest in yoga as a tool for navigating life. $40 / $35 when registered by 12/25. You don't have to escape your life to find your bliss. In this one-day mini retreat, you'll learn how to bring more mindfulness into the chaos of day-to-day life. This program is for anyone who wants to transform their relationship to stress, anxiety and tension. You'll learn to read your body's stress cues, respond instead of react, and develop self-care skills that last. The day will include embodied yoga practice, journaling and partnered reflection, mindfulness education, and group discussion. Facilitated by Yoga Therapist Alex Bauermeister, you'll leave with new awareness that can be immediately applied to day-to-day life for greater health and happiness. All bodies, abilities and experience levels welcome. Please email alex@intrayogatherapy.com with questions. Yoga Therapy training with Alex Bauermeister will fundamentally change how you show up in the world. You'll learn to listen, heal and connect differently. You'll learn fluency in working with bodies, hearts, minds and nervous systems. You'll come to embody the qualities that support healing : empowerment, radical acceptance, transformational inquiry, trauma literacy, and skillful facilitation of therapeutic experience. Alex Bauermeister teaches as a faculty member of the school of Phoenix Rising Yoga Therapy. Level 1 of Phoenix Rising Yoga Therapy training is the "gateway" training to test the waters of yoga therapy. You can use the 32 hours towards Yoga Teaching Certification or Yoga Therapist Certification, or simply add it to your own portfolio of learning. GUIDANCE FOR CEU'S FOR MENTAL HEALTH PRACTITIONERS: Procedures for applying for Continuing Education credit varies by Board/certifying body. Some Boards require the provider to apply for pre-approval as a provider, some require pre-approval of particular courses, some do not require pre-approval at all but may provide guidelines for you to follow when choosing courses. Please inquire with the appropriate Board/certifying body to determine what action you or PRYT will be required to take if you wish to submit this course for CE credit. Got stress? Join Alex Bauermeister for this 5-week transformational yoga journey to loosen the grip of stress, anxiety and tension on your life so you can thrive. Urban Awakening helps you TUNE IN instead of TUNE OUT. Each week includes yoga-inspired movement, meditation, education, discussion & homework to transform your relationship to stress. You'll get to know yourself better, bring more compassionate awareness to your interactions, and practice mindful interventions amidst day-to-day challenges. Whether you're a beginner or an experienced yogi, you'll be able to apply these mindfulness practices to life and see yourself and your relationships transform. Got questions? Contact alex@intrayogatherapy.com or visit www.intrayogatherapy.com. Alex Bauermeister is a yoga teacher and Phoenix Rising Yoga Therapist in Boston (Roslindale Village). She specializes in bridging trauma-informed mind-body healing with practical, real life tools that make the day-to-day stuff better. Learn new responses to old habits at Alex Bauermeister's Mind-Body Chill Pill: Yoga Therapy for Anxiety and Stress workshop and get out of fight, flight, and freeze mode, and tune-in to your true self. This intro workshop will include a group practice and an interactive discussion honing in on the mind-body connection. Get empowered to move through the world with more ease. Join Alex Bauermeister for this gentle yet fiery flow to raise money for the American Civil Liberties Union. Set against the backdrop of an invigorating soundtrack, Alex will guide students through her signature style of intuitive, meditative slow flow to fuel conscious resistance. The ACLU is on the front lines of legal action to defend human rights in our country. Now more than ever is the time to support this important and courageous organization. All proceeds from this benefit will go directly to the ACLU. To make an additional donation, please bring a check made out to ACLU Foundation of Massachusetts. All proceeds from this benefit will go directly to the ACLU. All workshop sales are final.